Korean researchers have developed a new type of lithium-sulfur battery using vitamin C with a 20% improvement in performance over current ones. A group of researchers led by Professor Lee Jae-young at the Gwangju Institute of Science and Technology said on Thursday that they succeeded in improving the energy capacity of lithium-sulfur batteries with vitamin C treated dual-layered graphene-sulfur. Lithium-sulfur batteries are widely considered as a viable replacement for current lithium-ion batteries for electric cars because of its superior energy density. Yet, lithium-sulfur batteries have not been actively used in the field yet since there are a few problems to be resolved such as poor cycle performance and low charge/discharge rates. 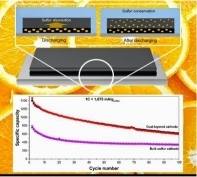 However, the researchers showed that their vitamin C treated dual-layered cathode, which is composed of a sulfur active layer and a polysulfide absorption layer, can increase sulfur utilization dramatically resulting in a lithium-sulfur battery with a high specific capacity of over 600 mAh gsulfur (-1) after 100 cycles even under a high current rate of 1C. The results of the development were published in the online version of ChemSusChem on April 29 with the title of “Improvement of energy capacity via Vitamin C-treated dual-layered graphene-sulfur cathodes in lithium sulfur battery”. VW presented the Golf GTE Sport in a world premiere at the legendary GTI event at Lake Wörthersee on 14 May 2015, Volkswagen is catapulting the GT tradition into the future. The high-tech Golf that is largely made of carbon is powered by a total of three motors - combined in a plug-in hybrid drive with system power of 295 kW / 400 PS. The concept car breaks down traditional barriers between road and motorsport vehicles. Its progressive hybrid system in combination with the high-tech all-wheel drive, a lightweight body, optimum aerodynamic down force, precision running gear based on the design of the current Golf GTE, a new motor racing cockpit (including visualisation of the racing line) and an unusual seating concept (two monocoque-like interior areas) enable breathtaking performance on the racetrack. At the press of a button, however, the concept car is able to cover a distance of up to 50 kilometres on electric power alone and hence with zero emissions.